Telemicrosurgery requires specific installation, completely different than in conventional microsurgery: robot position with regard to both the patient and the surgeon, surgical approaches, dissection of and support of a convenient surgical cavity allowing enough space for both camera and surgical instruments to move unimpeded. Installation of the microscope is far easier in conventional microsurgery than in robot in telemicrosurgery. 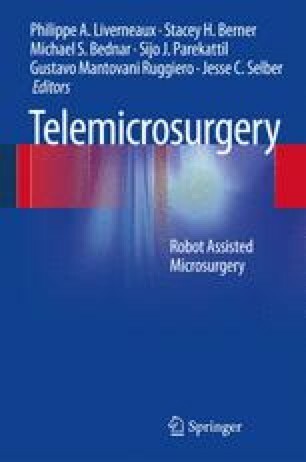 In telemicrosurgery, the arms of the robot do not extend significantly beyond the robot’s body, but are aimed instead towards the body. The body of the robot needs to be installed facing the telemicrosurgeon, as if the robot was about to perform a conventional microsurgical procedure. Telemicrosurgery can be performed either by open approach or by minimally invasive means. Using a conventional open approach, telemicrosurgery does not require any alteration in routine other than robot installation. Minimally invasive telemicrosurgery limits the potential for scar tissue formation. Surgical approaches and indications are subject to the same requirements as in conventional laparoscopic telesurgery. In telemicrosurgery, the surgical field is located inside a cavity which needs to be at first dissected and then maintained during the procedure. Installation of a telemicrosurgical procedure is complex, and adherence to several principles is warranted.